Ibérico Bellota Pork Loin for sale. Buy online at Zingerman's Mail Order. Gourmet Gifts. Food Gifts. Shocking. There’s no other way to describe the experience of first tasting cured bellota pork—in this case, the loin made from heirloom Ibérico pigs who’ve feasted on acorns (bellotas) the last months of their lives. 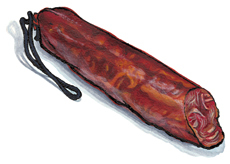 Even in Spain, where cured pork is a staple, eating Ibérico Bellota is a very special event. The acorn diet has a magical effect on the meat’s texture. It appears to lower the fat’s melting point to body temperature. Eating a thin slice is like placing a piece of chocolate on your tongue—it immediately puddles, the flavor releasing itself in the process. A cut of loin is about a foot long, the thickness of a baseball bat handle. It’s riddled with fat: tiny, creamy white flecks among the rosy flesh. Outside it’s coated in paprika, which, while not spicy, gives each bite a tiny peppery tingle. This is unbelievable stuff. Eating it is a carnivorous event unlike any other. Slice thin, and serve at room temperature. Kept wrapped in the refrigerator it will last for months. "The most astonishing thing about it was the fact that the taste of meat was so directly present. I have slices of both Italian prosciutto and Columbus felino salami in the fridge, and I couldn't help but notice after trying the Bellota loin how dominant the taste of the curing process was in these other two. It was like realizing the difference between genius and talent."